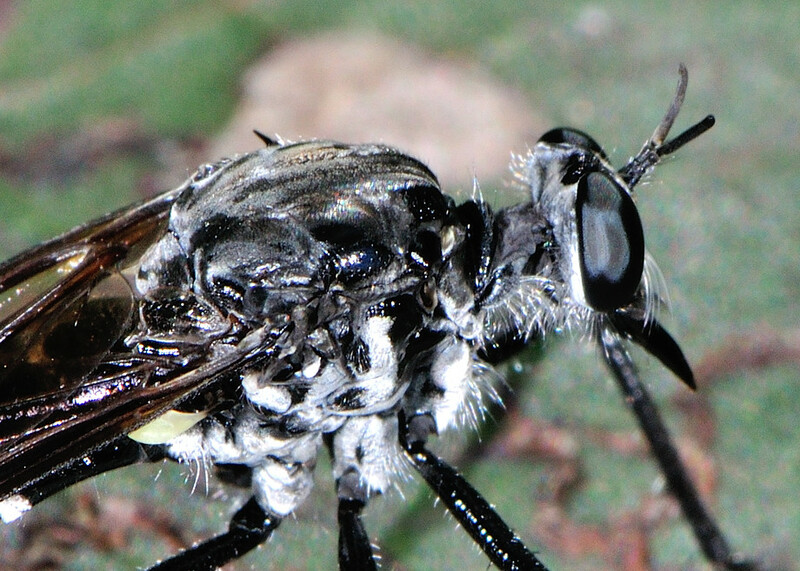 This page contains pictures and information about Wasp-mimic Robber Flies in Subfamily Brachyrhopalinae that we found in the Brisbane area, Queensland, Australia. 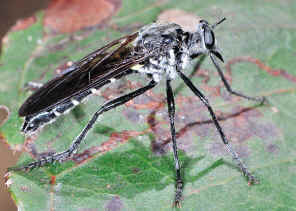 Robber flies in this subfamily have the wing vein R2+3 open, ending on the wing margin. Their antenna terminal is sometimes thickened. The fore tibia with an apical spur; one of the spines at the apex of the ventral side of the fore tibia is enlarged. 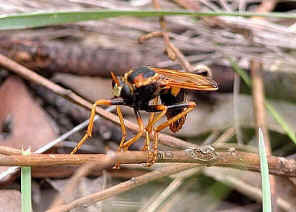 Some robber flies in this subfamily have orange or yellow marking on body or wings to mimic Apoid and Vespid wasps. Brachyrhopalinae is a new subfamily in Asilidae. Those robber fly species were recognised within Dasypogoninae by the large spine on the front tibiae. 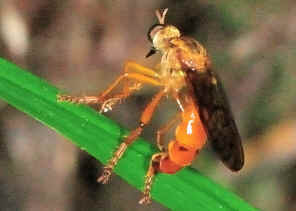 This has been used as a diagnostic character for Dasypogoninae. Based on the phylogenetic hypothesis derived by Dikow (2009) this spine has been independently derived at least once in the Australian Brachyrhopalinae. This group is transferred to the newly erected Brachyrhopalinae. 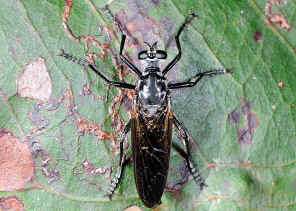 Robber Flies in this tribe can be distinguished from others by the presence of a pair of short stout spines above the wing-insertions. 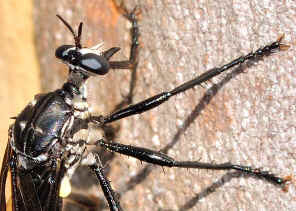 The antennae are three-segmented with first and second segments are short. The third segment is twice the length of the two basal segments added. There are no or very few hairs on thorax. This tribe is confined within Australia and Papua New Guinea. 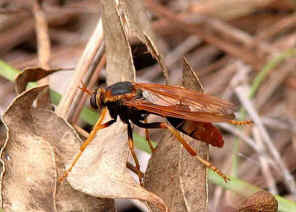 In mid summer we found this Wasp Mimic Robber Fly hunting on the ground among the dry leaves in Mt Cotton bushland. At first we thought it was a wasp. 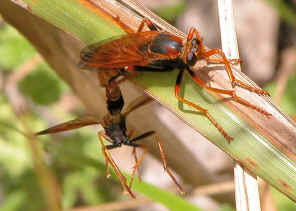 It is actually a robber fly mimicking a wasp. 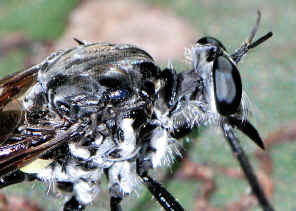 The antennae and the stance in the second picture are typical of robber flies. 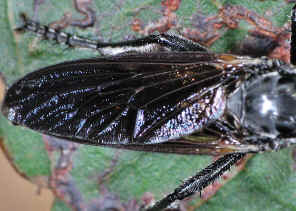 More information and pictures about this fly can be found in this page. 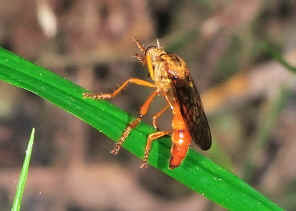 This Robber Fly is bright orange in colour with dark wings. We found it in Ford Road Conservation Area on Feb 2011. 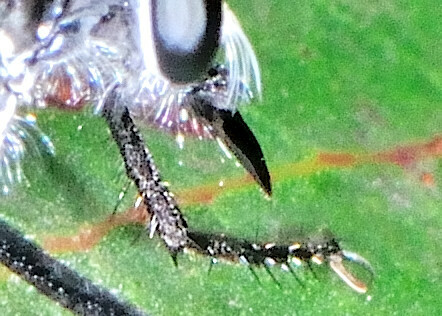 The fly was flying in short distance between low plants hunting for prey. Please check this page for more information. 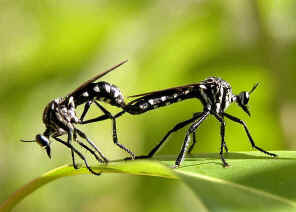 The Robber Flies have alternating black and white strips on body so we called them Zebra Robber Flies. We saw them a few times in Karawatha Forest during mid summer. 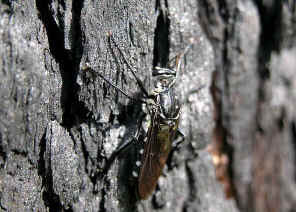 This Rubber Fly waits for prey on tree trunk. Please check this page for more information. Robber Flies in this tribe can be distinguished from other tribes by the presence of a pair of short stout spines above the wing-insertions, as shown in the above close-up image. 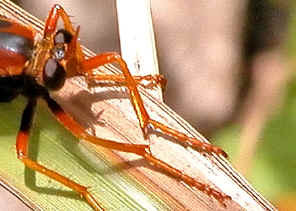 Please check this page for more information about this robber fly. 5. A taxonomic revision of the tribe Chrysopogonini (Diptera: Asilidae) - Clements, A.N. 1985, Australian Journal of Zoology, Suppl. Ser. No. 109. 93 pp. Last updated: October 25, 2012.